Do not like this couch at all. Feels way harder and cheaper than it did in the store. Giving off a horrible chemical smell. R and F wont accept a return or exchange. Don't waste your money on this couch. We Almost bought this sofa online as I didn’t think we had an outlet center in our area. Luckily I called and found out we did so we took a ride to check out the Desmond. Love the style, love the color but this sofa has zero support, it sinks a lot when you sit and the cushions on the back have no support, none. So glad we checked it out because reviews here indicated it was firm and it is not in any way shape or form! I have given up on finding a tight back sofa and I refuse to buy pillow back! Simply awful! Never buy online...go in to the store and make sure it's for you before you commit, lesson learned. I absolutely love this sofa. My family and I are all together as planned and can enjoy movies and a great time on the comfortable sofa. I have three small children and this was a great product for the children. It is easy to wipe clean and child proof. My family is happy with their sofa. We recently got it and we love it. I was a bit concerned about the size fitting in our apartment but it did. If you're looking for a nice sectional that doesn't swallow you when you sit on it, then this is the one for you. The 2 piece sectional is comfortable and looks good, hopefully the construction is sturdy. I love the charcoal gray color, very comfortable couch, fit perfectly in my new livingroom! 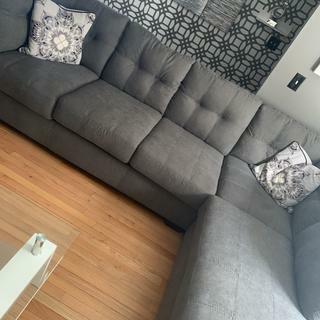 I recently purchased this 2 piece sectional in the charcoal gray color. I was concerned about the quality, given that it was so inexpensive, but I'm pleasantly surprised to say it's very comfortable and looks much more hi-end than it is! Overall very happy and would recommend to a friend. I really love this sectional! It’s so fluffy but not too giving. It looks classy but is comfortable enough to sleep on. The RF team was extremely helpful in the purchase and delivery process, as well. The couch is great and I love how it looks! The delivery team was amazing! I have a winding staircase and an awkward front door angle, but the guys worked very hard, did a fantastic job of getting it inside and were very nice. This sofa provides lots of seating, is good quality and comfortable. Perfect fit. The sofa is very comfortable, study and has great support. The build quality looks t and they are very stable. Love it!!!! Very comfortable but firm. The material is nice and sturdy but looks great. It's just the right size for my living room and I am very happy with my purchase. It is beautiful. Lindsey was great and made sure we were happy with our purchase and went the extra mile to accommodate us. I am very happy. Love the sofa. I've had it for about a week now and the whole family loves it. Super comfortable and loves sleek as well. The price was also great. Can't beat it. Awesome for the price! Firm but comfy, kid friendly, looks great! Great couch for the price! The only issue I had with the couch was the delivery from R & F. They delivered the wrong color couch.. which then delayed my move in process. BUT I called the store that I went to and it was all taken care of! I would get the couch again! Very nice looking sectional. Cushions are very firm but comfortable. The chaise section is huge and perfect for lounging. Purchased this for a basement den. Didn't want to spend a lot of money. Incredibly durable and comfortable and it looks fabulous! Love the quality of this couch, its perfect! Love this set! Fits beautifully in my living room . Doesn’t come with pillows but that leaves room to pick any color scheme. I absolutely love my Desmond 2 piece sectional sofa!!! It is so comfortable (firm seating). The charcoal gray is beautiful. It is a tall sofa (didn’t think to measure height but not a big deal for me). I feel like it will be durable and (sadly but thankfully) it cleans easily. Dirt brushed off easily after my puppy jumped up on it with muddy paws. I like that the back pillows are attached and comfortable. I’m just so happy about this purchase!!!! The price was amazing and delivery and set up was quick and easy. They were very accommodating about working with me for a delivery time around my work schedule. Go get this sofa!!! I just love this set. Wasn't sure about the size, but it fit perfectly. It has this gray denim look that can go with all shades of grey and blue. The height of the seat is even great for tall people. The couch high back and firm cushions will help you to relax when you put your feet up. It took more then a year to press the order button and I am happy i did. Hi Gail, we are pleased that you love your new sofa. We know purchasing furniture is a big investment but we are glad that you are happy with your decision. Thank you for your review. I love the sofa. It fits perfectly in our new home. Awesome deal! So comfy. It doesn't sink when you sit in it. Fits perfectly in my apartment. We got the gray sofa, and it's fabulous. It is super soft and comfy. It fits perfectly in our living room. Just perfect! Exactly what I expected. Just what I wanted! Super comfortable and exactly what I expected. Raymour and Flanigan is an awesome place to buy. I'll definitely be back! Good price, good product, and prompt delivery. I am very pleased with my sectional sofa. The online picture was a good representation of the product. It is more comfortable than many of the more expensive sofas that I sat on in several local stores. The delivery was prompt and convenient. The delivery persons were cordial and professional at meeting my needs. Good price, good product, and prompt delivery. I look forward to being a satisfied customer again in the future. Excellent sectional at a great price! I spent alot of time looking for a sectional that was a good size and didn’t cost thousands of dollars and when I found this one I thought it was just about perfect! It’s more firm than the display model at the store but I don’t mind that at all because it is just more supportive and it is very comfortable. The style fits great with my modern themed condo and it really brings the living room space together. I think you’d have a hard time finding a better sectional for the money and the delivery was great. They brought it in and got it set up in less than 10 min. Bottom line is I would recommend this sectional and Raymour and Flanigans to anyone I know. My four roommates and I finally settled on this couch after a lot of research and debate, and we couldn't be happier. It accommodates us, plus plenty of friends. It's comfortable enough to sleep on, and the chair cushions while hard at first eventually become more comfortable through use. The back cushions are extremely comfortable and supportive. Overall, great buy! My friends fall asleep when they come over. This is the most comfortable couch ever. I like to think my fiance and I are pretty interesting and entertaining, but anyone who nests themselves into that corner or cushy goodness falls asleep on us. We might just all be getting old too, but I like to blame it on the couch. It is a little firmer when it gets delivered than the one in the store, but keep in mind that the one in the store gets plopped down on multiple times a day. Give it time, and it will break in. It is such a great value. Seating for 5 + on a tight budget, something I could not believe it would be possible. Love the stitching, the comfy, full bottom cushions, the color and the contemporary lines!!!! Very comfortable and firm couch. Do recommend purchasing. Love this couch from the moment we saw it and it is extremely comfortable. Perfect addition to our living room. This couch is extremely comfortable. Dustin, thanks so much for taking the time to leave this review! We're so glad to hear you had such a wonderful experience with our team. If you'd like to leave a review for the specific showroom you shopped at, please visit our Google or Facebook pages—we're sure the team would greatly appreciate it! I don't have a photo of it, but it is one of my best purchases in years. I love it!!!! This is much nicer than the picture. I went to the outlet in Deptford. The showroom is very nice . Everyone I talked with was friendly and professional. The moving men were great also. They helped me check for damage and put it together for me. I love this sectional. Time will tell if it holds up. But so far I have no complaints. The couch was pretty true to what we were told to expect can’t wait til to break it in! 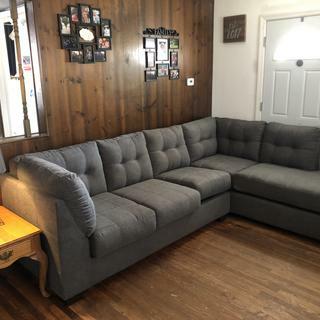 Love our new purchase, we ordered in the store since it was an outlet couch, we couldn’t see it but trusted our salesperson to show us the size and material in couches they had available . Nice for the price. Very comfortable. I would reccomend this sectional. The couch is very comfortable, the arms are a little high to lie down on. Otherwise very nice. Nice looking, roomy couch but there are some definite drawbacks. I really love the look of this sofa. And I love how big it is. I was worried when getting rid of my couch and loveseat that we'd lose a lot of seating space, but we didn't at all. However, having it only a couple weeks now there are definitely some drawbacks. The stitching comes loose easily. I pulled one out a bit just by sitting down with jeans on and it snagging. Also, it's very stiff and firm right now. I'm hoping that it will break in and be more like the one in the store. The back cushions easily get misshapen and I find myself fluffing them up frequently. Overall right now I still like it quite a bit, but time will tell if I'm still happy after a year or so. I spent months researching couches. I was really wanting a sectional but didn't want to spend over $1,000. I also didn't want a couch that was poorly made. I was so relieved to find this couch. The reviews are true- it really looks nice and seems sturdy so far (I've had it 1 week). I don't think the cushions are firm like people say, but I do prefer a firmer couch, so maybe I don't notice it. I paired it with their Carr rug and the color scheme looks wonderful. I love my couch so much it is super comfortable totally worth the money and worth having it delivered wish the delivery service had better communication. Love the deep gray color. Needs to be broken in, the one at the store felt softer. Overall, happy with purchase. I like the couch from the picture and it’s comfortable however were the chaise and the couch itself joins there a rather large gap. I would like to get this one replaced. It’s faulty and the gap is large. how long is the sofa w/o chaise. or what is the exact length of the chaise? BEST ANSWER: The seat depth on the sofa side is 22". Are outlet products damaged or returned items? BEST ANSWER: Outlet items are not damaged or previously returned. Furniture listed under the Outlet category are new products that are offered by Raymour & Flanigan at reduced prices and are on display at our Outlet centers. does this sectional have connectors to prevent it from sliding around? BEST ANSWER: The Desmond Sectional does include connectors. is this a pullout couch? BEST ANSWER: The Desmond 2-pc. Sectional Sofa you have selected is not a pullout couch, but we do offer one. The SKU# you are looking for is 299466497. Are the cushions permantly attached to the sofa? BEST ANSWER: The Desmond Sectional Sofa seat cushions are reversible and the back cushions are attached. It states 2 piece section with chaise but it is actually 3 pieces? BEST ANSWER: The Desmond 2-pc. Sectional Sofa is actually a two piece sectional. It includes a Right-Arm-Facing Corner Chaise and a Left-Arm-Facing Sofa. Can the chaise be made on the opposite side? I’m having a problem linking the connectors? BEST ANSWER: A reply has been sent directly to your personal email address including instructions for the connectors. Please contact Online Sales at 866-383-4484, option 3 for additional product details. you'll need to line up the 2 metal plates so one of them drops into the other from above. Its kind of tricky & Its easier with 2 people. Does this sofa come in any different colors? BEST ANSWER: The Desmond Sectional Sofa is available in the Charcoal color only. is the material for the sofa upholstery? BEST ANSWER: Hi JUlisa. The Desmond upholstery is a polyester/nylon blend and is classified as a microfiber. My doorway is 31 inches. Will this fit? BEST ANSWER: Yes. It should fit, the recommended width is 32" but the feet are removable. Is this sectional on display only? Meaning it is in an outlet store being tested by customers? Or can I order it new and in a box? BEST ANSWER: The items in the stores are for display and to try out. You would receive a brand new sectional sofa from our warehouse. Fantastic. Thanks for a quick response! Can you put outlet furniture on layaway? BEST ANSWER: Yes. With our free six-month layaway plan, you can select the furniture you want today and receive it when you're ready. Here is a link to our FAQ on layaway: https://www2.raymourflanigan.com/customer-care/frequently-asked-questions.html. If you need further assistance, please contact 866.383.4484. 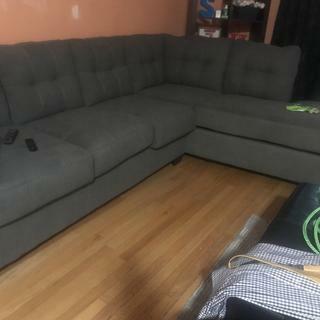 Is right facing chaise one or two pieces(there seems to be a seam that shows in a picture a customer sent in,but your pictures have a throw over it. )Does it separate where you sit and where you put your legs? BEST ANSWER: The right facing chaise of the Desmond 2-pc. Sectional Sofa is one piece. Is this product in the store or is it online only? BEST ANSWER: The Desmond 2-pc. Sectional Sofa is an Outlet item which is displayed at a Raymour & Flanigan Outlet Center. The Desmond Sectional can be ordered from our website, by telephone or from any Raymour & Flanigan showroom. Can the cushions be flipped? what type of fabric is this couch made of? Does this sofa have attached or independent back cushions so they can be fluffed? BEST ANSWER: The back cushions on the Desmond Sectional Sofa are attached. How does it come if in store pickup is chosen? In two sections? BEST ANSWER: Yes. It will be in two pieces. BEST ANSWER: The seat height is 22". Can it fit through a door measuring 27 3/4 w by 80 h ? BEST ANSWER: The Desmond Sectional Sofa would require at least a 32" wide doorway. The material says microfiber but is seems to be more of a denim? BEST ANSWER: The upholstery is a polyester/nylon blend and is classified as a microfiber. BEST ANSWER: Unfortunately, the Desmond Sectional is only available with the chaise included. what is the brand of sectional (ashley or benchcraft)? BEST ANSWER: The Desmond sectional is Ashley Furniture. Are the back pillows and cushions removable so they can be flipped? Also can it e change to left or right configuration?? BEST ANSWER: The Desmond Sectional Sofa is very comfortable.